This adorable CHARM IT! 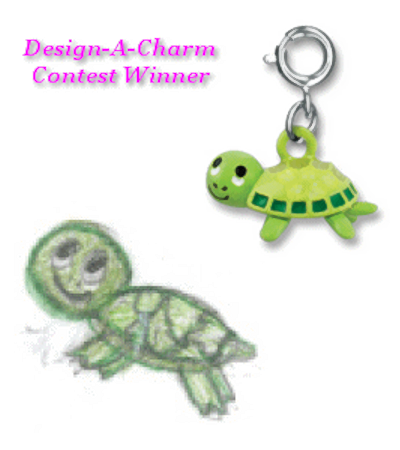 Baby Turtle charm is sure to be a hit with its fun green body, slightly glittered green shell, and sweet smiling face. One of 36 winning designs, the concept for this cute cow charm was submitted by 9 year old Madison from Connecticut during Charm It's Design-A-Charm contest. With part of the proceeds from the sale of each charm going to Madison's chosen cause (she wants to help save animals), this CHARM IT! Baby Turtle charm is not only a fun addition to charm bracelets and charm jewelry of all kinds, it also helps support a great cause! With a simple snap of a clasp, girls can personalize their CHARM IT! jewelry with this adorable CHARM IT! Baby Turtle charm. This classic, must-have CHARM IT! chain charm necklace is just waiting to be charmed. This cute little sea turtle stuffed animal keychain has soft green and lime green fur and a sweet, smiling face.